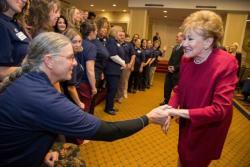 WASHINGTON (November 26, 2018) – In continuance of its partnership with the Elizabeth Dole Foundation (EDF), Wounded Warrior Project® (WWP) will participate in their 3rd annual national Caregiver Convening in Washington DC on November 26th. This national conference, sponsored in part by WWP, and co-hosted by EDF and the U.S. Department of Veterans Affairs, brings together over 400 national and veteran community stakeholders for discussions and roundtables focused on the challenges and needs of America’s military and veteran caregivers. Among the attendees are Vice President Mike Pence, Secretary of Health and Human Services, Alex Azar, Secretary of Veterans Affairs Robert Wilkie, and Senator Elizabeth Dole, who will be delivering remarks on the important role that caregivers play in our communities. The Military and Veteran Caregiver Experience Map documents major milestones and phases of the military caregiver journey, and measures the impact it has on their physical, psychological, financial, and social wellbeing. By mapping out key points where the right people, organizations, and service providers can step in and support caregivers as they adapt to their new way of life, EDF and WWP can help achieve better outcomes for our veterans and caregivers. WWP is also funding a collaborative partnership between EDF and National Military Family Association (NMFA) to measure the impact of caregiving on military and veteran children. Since 2012, WWP has supported over 120 different organizations involved in the care of America’s military community. This strategic collaboration among best-in-practice veteran and military organizations not only augments WWP’s existing programs and expands the impact we make on America’s wounded veterans but ensures that critical gaps in care are managed effectively, in communities that need it most. To learn more about how partnerships with organizations like EDF are transforming the way America’s injured veterans are empowered, employed, and engaged at the national and grassroots, contact our government and community relations team via Mattison Brooks or visit https://www.woundedwarriorproject.org/programs/community-partners.